My poor car has gone through 3 accidents, although I only have pictures from two. I bought my car in June of 2001. A month after I bought it, I was driving late at night when a car was coming head on in my lane. I swirved to miss him and hit a tree. Since it was my first car we fixed it with the insurance money. In September of 2001 I was driving home from my boyfriends' house. An oncoming car didn't turn their brights off, so i was watching the white line on the side of the road. I glanced up for a second to see the eyes of a very large deer looking right at me. 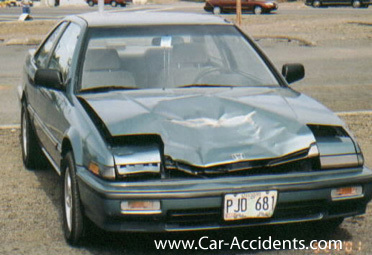 The first picture is the damage from hitting a deer at 60 mph. Again we fixed it. In December, I was heading to work, on a road I travel every day. When the green arrow turned for my turning lane, I coasted through the intersection. When I was just about out of the intersection, a lady talking on her cell phone ran her red light going about 45 mph. The 3 other pictures are from that. Third times' a charm!! We decided to take it to the junk yard after that!